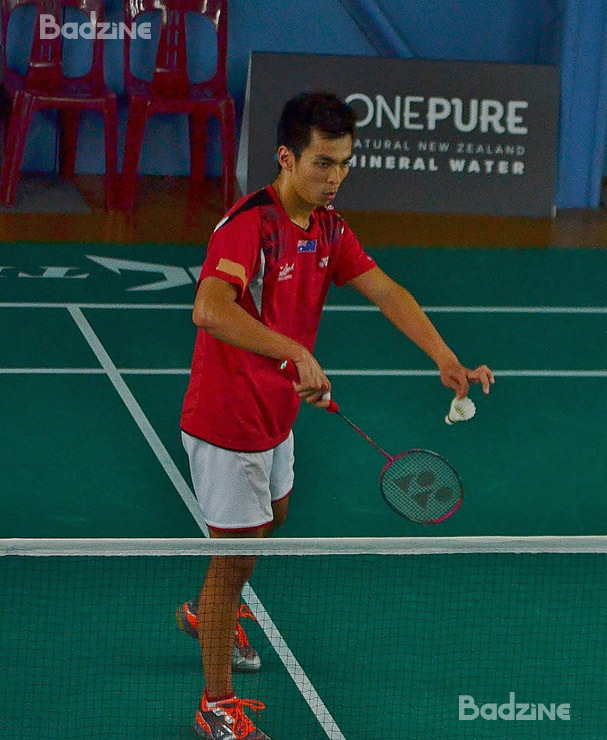 Of the 8 semi-finalists vying for multiple finals spots at the Oceania Badminton Championships, only Oliver Leydon-Davis of New Zealand and Australia’s Leanne Choo will be vying for two titles each on Sunday. The X-TRM Oceania Badminton Championships brings together the best players of the Oceania region, all striving to leave a mark in the history of Oceania badminton. Over the stretch of 4 days, players converged on Badminton North Harbour’s badminton hall, located in the North Shore region of Auckland Oceania Championships for the Oceania Championships, as well as the Oceania Juniors, which includes a mixed team event. Compared to the first 2 days of Oceania Championships, where the juniors had the morning time slot and seniors had a later start, semi-finals day had everyone getting ready for an evening start of 5pm, regardless of age. Women’s singles 2nd seed Jennifer Tam of Australia found herself on the wrong end of a game when she got defeated lopsidedly by compatriot Wendy Chen, even dragging by a 1-11 scoreline at the second game interval. By contrast, 2nd seed Robin Middleton and doubles specialist, Leanne Choo (pictured above with women’s doubles partner Gronya Somerville) coasted by Michael Fariman and Talia Saunders with nary a pressure. Jennifer Tam wasn’t one to fret over her defeat as she then proceeded to help her partner Talia Saunders get over her defeats and upset another 2nd seed, Emma Chapple and Danielle Tahuri of New Zealand. New Zealand’s Luke Charlesworth shared the hardest match with fellow compatriot and mixed pair Oliver Leydon Davis and Danielle Tahuri (pictured above), as they both clocked in the longest match times of the day at 44 minutes. What awaited them were see-saw matches as points and games were traded over long rallies. While Luke was able to take his first game narrowly, Ashwant Gobinathan started anticipating Luke’s shots more often, turning more rallies into his favour. Ashwant concluded his 2nd game with a score of 21-19, at the same time as his fellow Australians, Matthew Chau and Gronya Somervile, who also concluded their 2nd game with the exact same scoreline. Just then, the home ground advantage of the New Zealand players started to come into play, as the spectator’s cheers buoyed their players into action. Luke found his extra energy to turn his rallies into finishers, while Oliver stepped up his smash barrage, with the New Zealanders finally taking their matches with scores of 21-16 and 21-14 respectively. The junior semi-finals (results here) were even faster, with hardly any matches going past the half hour mark. Playing with the natural speed afforded by their small and light bodies saw the junior players exchange rallies that almost stretched the definition of godlike speed. Oscar Guo employed his fast drives to keep Daxxon Vong on his toes, while Benjamin Hillier played a retrieval game, stretching to return the fast shots thrown at him by Edwin Lau. Quite a number of the players demonstrated their skill at managing their matches over different categories. Doubles specialists Leanne Choo and Oliver Leydon Davis were the biggest winners as they each won their two doubles matches of the day. By contrast, for players like Wendy Chen and Jennifer Tam, who juggled both singles and doubles, lady luck flipped a single coin that decided defeat in one category, but rewarded a victory in the other. Talia Saunders was the only tri-disciplinary player in the semi-finals, but her 3-sided die only had a single chance of victory, as she lost out in singles and mixed but still has a chance in women’s doubles. 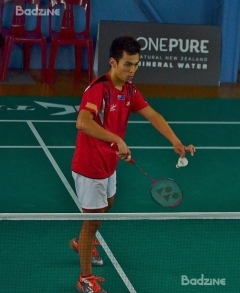 Of all the twin category players, Michael Fariman (pictured) had the worst luck, as the coin he got turned out to be 2 sides of defeat for both his men’s singles and mixed doubles.